Fil de Fer has a wide range of antique console tables. Be inspired. Discover everything, from industrial style metal console tables to elegant and exclusive wooden console tables with hand turned or tapered legs. These charming narrow tables are ideal as hallway pieces, placed behind a sofa or just as decoration to place your ornaments, books or lamps. 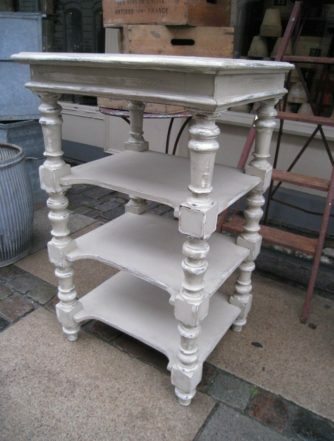 An antique console table is in its element amongst elegant, warm and French inspired décor. 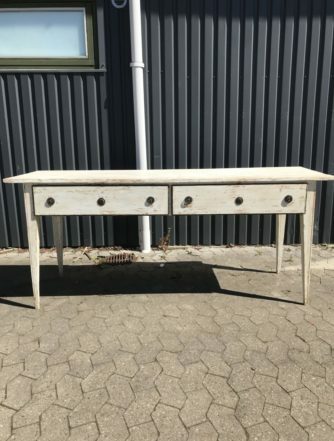 And vintage console tables, with their history and patina, would be a welcome soulful addition to any entrance hall or living room. 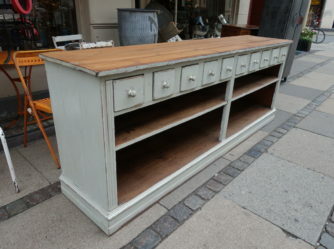 Right from Fil de Fer boutique’s very first days on Store Kongensgade, fabulous and original console tables have been very popular items. You will undoubtedly find your favourite amongst our exclusive and decorative selection right here online. A vintage industrial shelving unit made of steel adds a certain raw edge to your home, that is practical, unique and authentic. Authenticity here at Fil de Fer is a guarantee. Our finds are carefully selected and brought home from near and far. After all, ambiance and history are paramount for our clients. The history of the piece need not be mind blowing. Just as important to us are the small provenances. It is the life lived by the furniture which provides the essence, so that we and our customers connect with the pieces. Table on Wheels, Yes Please! From time to time, we are lucky to comes across super console tables on wheels, namely bar trolleys, which are in super condition. When this happens, retro tables can be unique décor pieces and handy at the same time. A table on coasters is lifted from floor level and adds a lightness to the room. But wheels also add flexibility to your interior. A mid-century glass console table on wheels is especially smart when choosing a living room storage item. Think of a bookshelf on wheels! No wonder they’re having such a revival! 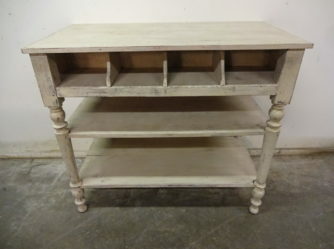 In our humble opinion, the popularity of antique console tables is totally understandable. 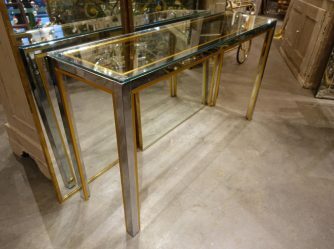 The patina we find in the tables just enhances charm and elegance, whether your favourite material is wood, brass or glass. An antique bar counter, which may earlier have taken pride of place in a café in France of years gone by, can be a different and warm addition to your living room. A vintage corner console table is a discreet and romantic decoration in the bedroom. It is the contrast between new and old which adds ‘je ne sais quoi’ and makes your home interesting and unique. Of that we are certain!